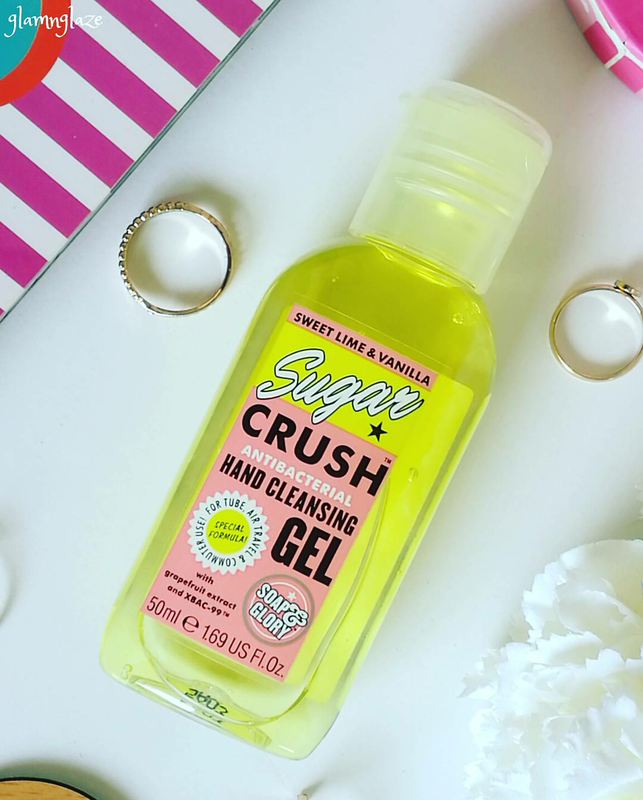 Today, I am going to share my thoughts on the The Soap & Glory skincare products : Hand Food & Antibacterial Hand Cleansing Gel from their well-known Sugar Crush collection. Aqua (Water), Glycerin, Butyrospermum Parkii (Shea) Butter, Cetearyl Alcohol, Ethylhexyl Stearate, Caprylic/Capric Triglyceride, Glyceryl Stearate, PEG-100 Stearate, Dimethicone, Prunus Amygdalus Dulcis (Sweet Almond) Oil, Theobroma Cacao (Cocoa) Seed Butter, Aluminum Starch Octenylsuccinate, Phenoxyethanol, Dipropylene Glycol, Carbomer, Caprylyl Glycol, Xanthan Gum, Mica, Potassium Hydroxide, Ethylhexylglycerin, Parfum (Fragrance), Titanium Dioxide, Benzophenone-4, Cocos Nucifera (Coconut) Oil, Vitis Vinifera (Grape) Seed Oil, Tocopheryl Acetate, Glyceryl Acrylate/Acrylic Acid Copolymer, Tetrasodium EDTA, Lactic Acid, Glycolic Acid, Limonene, Linalool, Aloe Barbadensis Leaf Juice Powder, Citrus Aurantifolia (Lime) Seed Oil, Actinidia Chinensis (Kiwi) Fruit Water, Citric Acid, Citral, Benzyl Salicylate, Malic Acid, Biosaccharide Gum-1, Salicylic Acid, Denatonium Benzoate, Benzoic Acid, CI 19140 (Yellow 5), CI 42090 (Blue 1). 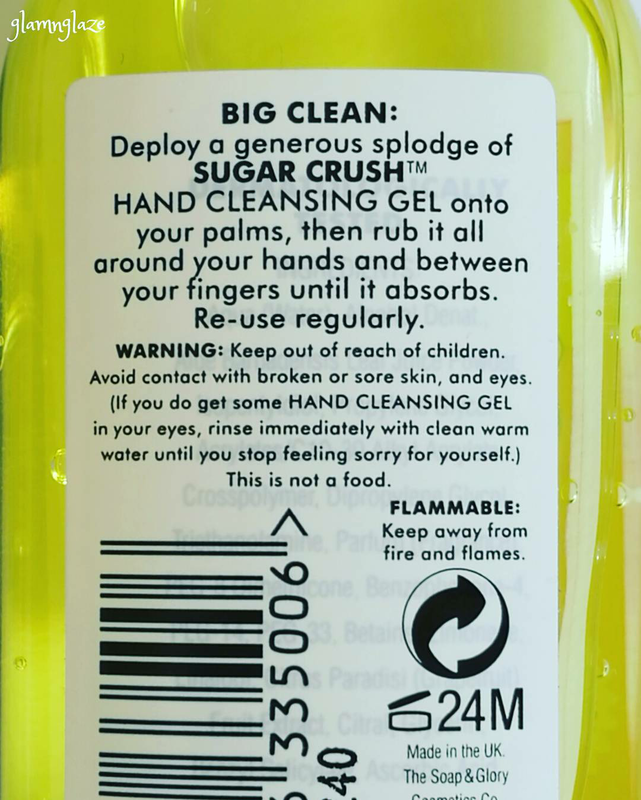 Ingredients of the hand cleaning gel have not been mentioned anywhere on the packaging or on the official website. Amazing! Award-winning! 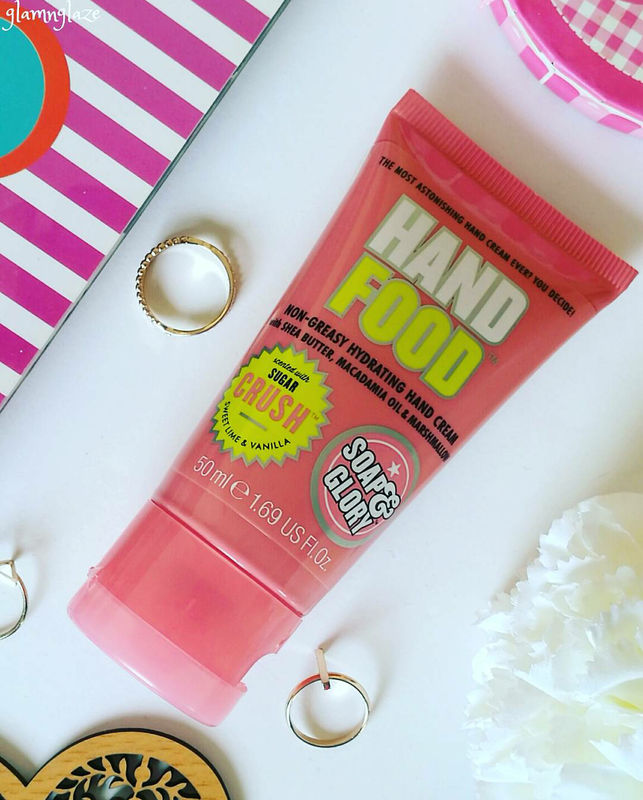 Our legendary mini HAND FOOD™ (now in our irresistible sweet-lime SUGAR CRUSH™ fragrance) is Boots’ bestselling hand cream*. So trust us, girls, if you want soft, scrummy hands, you NEED this handbag hero. With moisturising shea butter, macadamia oil and marshmallow, it’s non-greasy, non-sticky – and there’s no way you’ll be able to keep your mitts off it.The most astonishing hand cream ever? You decide! 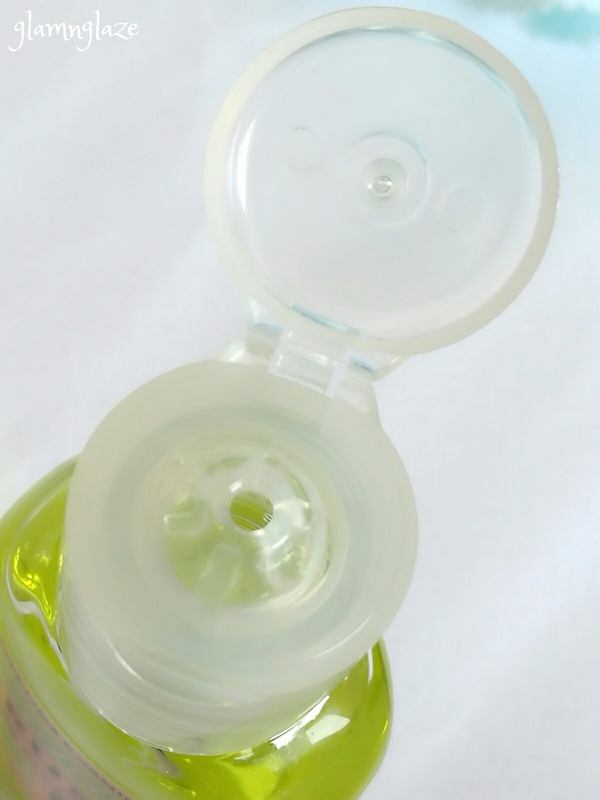 The ultimate in cleanZING (that smells ama-zing). 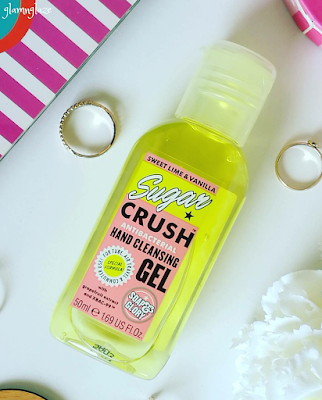 Soap & Glory’s SUGAR CRUSH™ Antibacterial Hand Cleansing Gel is your must-have, non-drying, travel companion. In our irresistible SUGAR CRUSH™ fragrance. FLAMMABLE: Keep away from fire and flames. 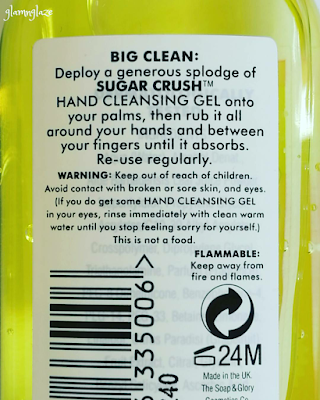 BIG CLEAN: Deploy a generous splodge of Sugar Crush™ hand sanitizer onto your palms, then rub it all around your hands (covering all surfaces) and between your fingers until it absorbs. Re-use regularly. Why you should try this combo? 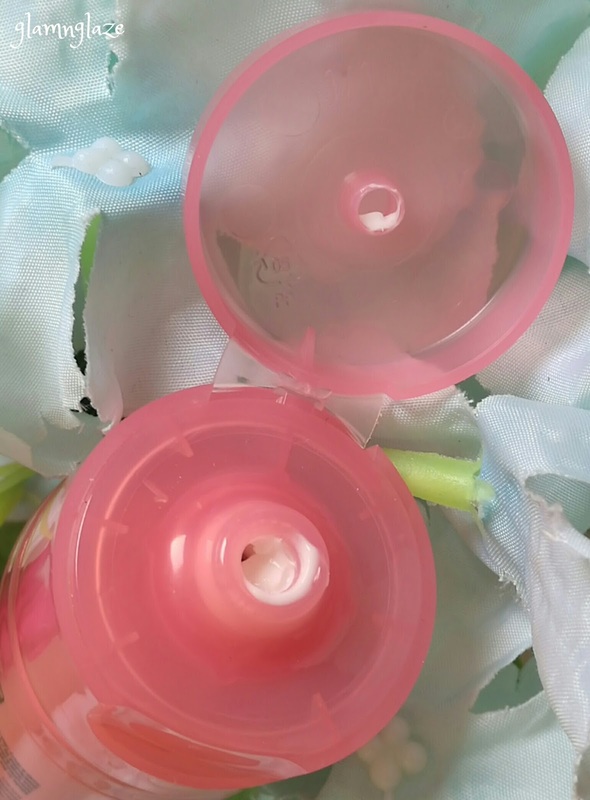 Nice and pretty packaging.All the details like quantity,ingredients ,shelf-life etc are mentioned on the packaging.The product comes in a pink-plastic tube and with a flip on head/cap.Easy to squeeze-out and use.Hygienic and travel friendly packaging.Love it! Takes good care of the dry-skin.Keeps it nourished. 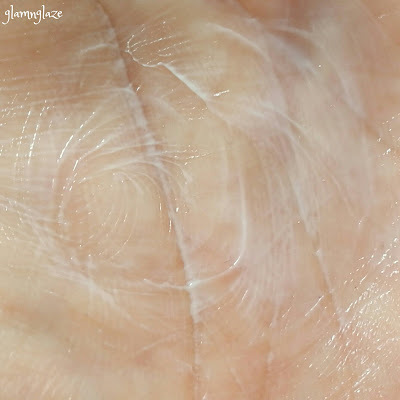 The hand food smells incredibly amazing(lemony).Not strong at all(depends from person to person).People with sensitive-nose can relax as the fragrance is not overwhelming and fades away after few minutes. 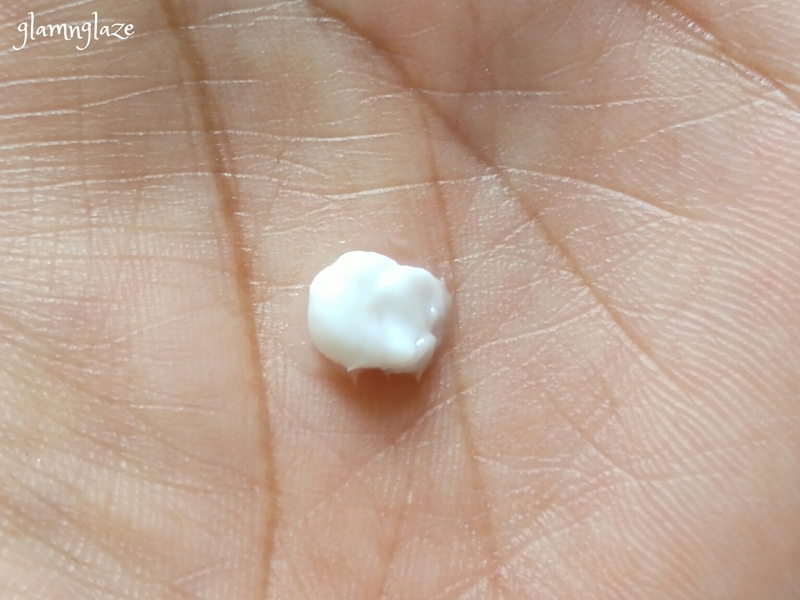 In Pic : Shown Thin and creamy consistency of the hand cream. Attractive packaging.Transparent plastic bottle.Ingredients are nowhere mentioned.Details like quantity,warning,shelf-life are available on the packaging. Sturdy & travel-friendly packaging.Did not experience any kind of product-spillage in my handbag. Flip over head/cap.Need to squeeze the bottle to take out the product. The product has no colour as such but, has got a lemon-yellow hue to it.That's why it looks yellow in the bottle.Nothing to worry.It's a clear-gel.It has gel-like texture(of course).Thin consistency. The hand cleansing gel is very light-weight in nature. This antibacterial hand sanitizer is effective.It smells citrusy(lime and vanilla fragrance).It leaves the skin squeaky clean.Skin feels fresh and breathable. 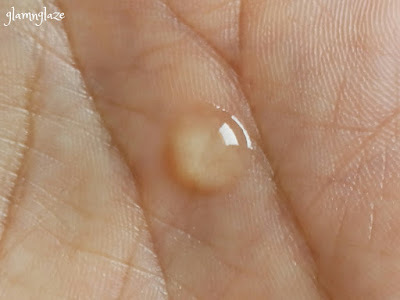 Anti-inflammatory nature of macadamia nut oil can help soothe the skin and moisturize it at the same time, leaving smooth, healthier skin behind. If you love citrusy-fragrances then you must try out these products.These products are really great and work fine.I am sure that you will love these products. P.S. It's a repurchase.I had purchased this combo for the very first time (few months back) from @bootsmiddleeast . Really love the combo.I'm impressed.